On Tuesday, January 31, asteroid 433 Eros will come closer to Earth than it has in 37 years, traveling across the night sky in the constellations Leo, Sextans and Hydra. At its closest pass of 16.6 million miles (26.7 million km) the relatively bright 21-mile (34-km) -wide asteroid will be visible with even modest backyard telescopes, approaching magnitude 8, possibly even 7. It hasnt come this close since 1975, and wont do so again until 2056! 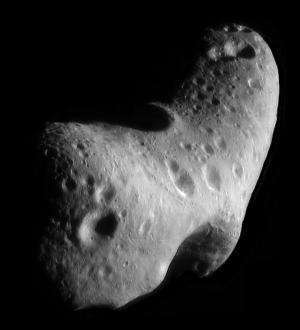 433 Eros is an S-type asteroid, signifying a composition of magnesium silicates and iron. S-types make up about 17 percent of known asteroids and are some of the brightest, with albedos (reflectivity) in the range of 0.10  0.22. S-type asteroids are most common in the inner asteroid belt and, as in the case of Eros, can even pass within the orbit of Mars. Occasionally Eros orbit brings it close enough to Earth that it can be spotted with amateur telescopes. 2012 will be one of those times. Eros was discovered on August 13, 1898, by astronomers Carl Gustav Witt in Berlin and Auguste Charlois in Nice. 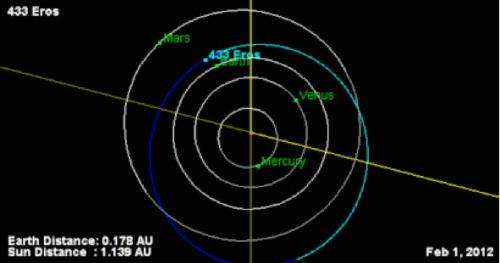 When Eros orbit was calculated it was seen to be an elongated oval that brought it within the orbit of Mars. This allowed for good observations of the bright asteroid, and eventually led to more accurate estimates of the distance from Earth to the Sun. In February 2000 NASAs NEAR Shoemaker spacecraft approached Eros, established orbit and made a soft landing on its surface, the first mission ever to do so. While in orbit NEAR took over 160,000 images of Eros surface, identifying over 100,000 craters, a million house-sized boulders (give or take a few) and helped researchers conclude that the cashew-shaped Eros is a solid object rather than a rubble pile held together by gravity. View NEAR images of Eros surface. which is invaluable information when deciding how best to avoid any potential future impacts. Although Eros will be making a close approach to Earth on Jan. 31/Feb. 1, there is no danger of a collision. It will still remain at a very respectable distance of about 16.6 million miles (26.7 million km), or 0.178 AU. This is over 80 times the distance of the much smaller 2005 YU55, which safely passed within a lunar orbit radius on November 8, 2011. Also theres an updated chart on Heavens Above showing Eros current position. Eros should remain visible up until Feb. 10. We really should use such a close encounter one of these days to try out various ways of altering an asteroid's path in a (relatively) inexpensive way. It would provide excellent possibilities for measuring the results, since we could bring all of (near)Earth's observational capabilities to bear. Since NEAR made a soft landing on the surface of 430 Eros, where are the pictures taken from the asteroid's surface? Seems we get to see only photos taken many miles away from the surfaces of moons and asteroids - why is that? Which is from an altitude of down to 120 meters (shot during the descent). "If I read the mission profile correctly then the rendevouz was also at about 2AU distance (which means that there is only a quarter of the light available than on Earth - consequently they needed to up the exposition time to get better pictures.)" C'mon, that's only 2 f-stops and the albedo is high. CCDs are more attuned to the infrared spectrum (I'm not at all sure the pictures on the NASA website are visible light pics). Albedo is over the entire range of radiation...Eros probably has a different spectral distribution from Earth, so the number might be even lower for the radiation the CCD is sensitive to (or it might be higher). Add to that that they wanted the pics to be sent before the craft hit (because they couldn't be sure that it would continue working afterwards)...and the number of pics you can send becomes severly limited during the last stages of 'landing' - because the bandwith over interplanetary distances is rather low.